Some individuals do have basic wills in place, but use additional documents to correct oversights or as a safeguard. For example, someone who established a revocable trust to hold his assets during his lifetime might use a pour-over will to address any assets he neglected to transfer to the trust. A pour-over will sends these assets, the “residue” of his estate, into his trust at his death. A testamentary trust will creates one or more trusts at his death and moves his assets into it. Both afford the option of distributing assets to heirs on a regulated basis rather than in a windfall. Neither will bypasses probate, however. Assets would have to pass through the probate process in order to move to the trusts. The 65 percent of Americans who do not draft wills might find themselves in the position of knowing death is imminent and wishing they had done so. The laws in some states accommodate this eventuality. Nearly half of all states recognize holographic, or handwritten, wills. Some states require that witnesses sign a holographic will; others do not. In most jurisdictions, someone would have to attest that the handwriting and the signature are yours. A few states also accept nuncupative or oral wills. You can speak your dying wishes to someone, who is then responsible for committing them to writing on your behalf. Various states have different restrictions for accepting a nuncupative will as legal. When a testator has reason to believe an heir will contest his will, he can take extra steps to make that more difficult. 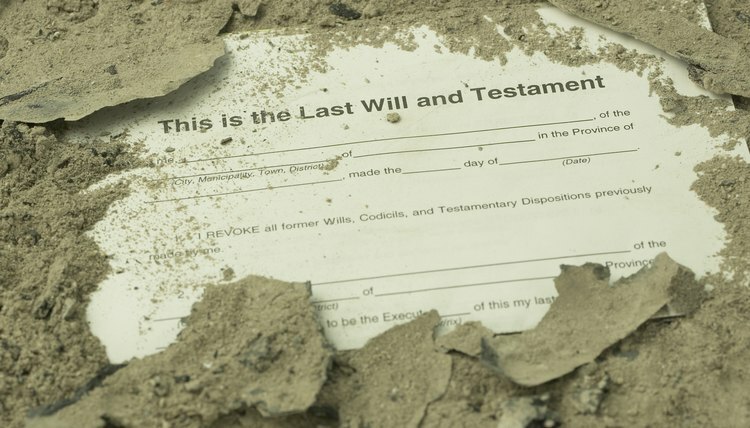 He can add an “in terrorem” clause to his will, stating that if a beneficiary files a will challenge, she loses everything — even the bequest she was given. Some people create conditional wills to ensure that if they die sinister deaths, the provisions are void. This prevents your assets from transferring to someone who might be responsible for your untimely death. Other testators create video wills, reading their provisions aloud on camera to prove their mental competence. A video will allows a testator to orally and visually explain his bequests, but most states do not usually accept one as a legal will on its own. It supports a written will. Married couples and domestic partners can intertwine their wills. In a joint will, each spouse or partner bequeaths his share of assets to the other. This has legal drawbacks, however. When one partner dies, the survivor is “stuck” with the joint will. He cannot supersede it with a new one if he remarries, except to cover assets not included in the first joint document. A mirror or reciprocal will operates in much the same way, but also provides for joint bequests to others if both partners die simultaneously. Unlike a joint will, if the partners don’t die together, the survivor has the option of writing a new will of his own to address and disburse the assets he inherited from the other. Strauss & Mark: What is a Will?